Etudes offer a feature called “Import from site” which allows you to import ALL the tests, assignments, and surveys from one site to another. 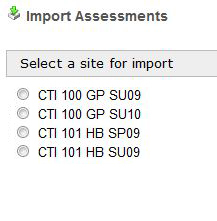 What if you need to import only one or two assignments? To do that, you want to use the “Import” function that is available in Assessments. You can import from another Etudes site that you own or from a test bank in supported formats (either from an exported set of tests from Etudes or from other systems). Step 1: Click on Import. Step 2: Select Import from AT&S. Select a site and click on OK at the bottom. Step 3: You will now see a list of all the assessments that you have in that site. 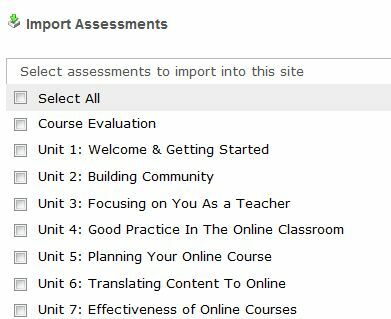 Check the boxes of the assessments that you’d like to have copies of in your destination (current) site. Click on OK at the bottom to continue. A copy of the selected assessment(s) will be imported over, along with its master pool. Click on Import under Assessments (or Pools). Select “Import from a QTI file”. Browse and select the package, and finish the process. The tests with their pools will be imported. Etudes supports QTI 1.2 and 2.0 and 2.1 test bank formats. In addition to QTI, you can import question banks into Etudes from other systems in several supported formats. Examview, Question Mark, Respondus and other test banks can be imported if the question banks are in one of the following formats: Blackboard 7-9, eCollege / Pearson / My Labs, Moodle 1.9 – 2.4. Go to Site Setup on the left side of your course site. Select the type of import question bank you have, and then browse and import the file. Return to Assignments, Tests and Surveys to review the imported question banks. Whenever possible, Etudes creates corresponding tests from the test banks.